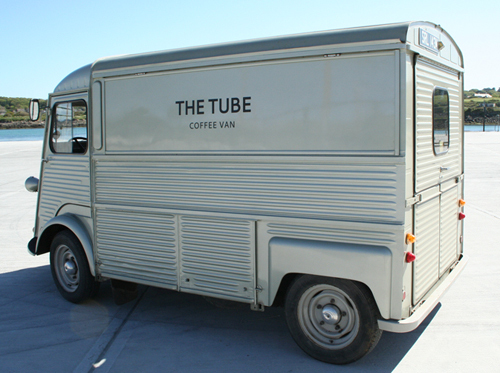 We would like to introduce you to The Tube, a beautifully restored and converted, vintage Citroen HY van, serving the best organic coffee in a sustainable and environmentally friendly way! The Tube is a new and exciting, family run business - created by Simeon and Josie, with a strong emphasis on quality products including fine coffee and home-made cakes all dished up from our beautiful and unique van. "I can honestly say that's the best Cappuccino I have ever tasted!" The Tube is more than happy to potter along to any event in Cornwall. Further a field maybe an issue, but hey, anything is possible! Weddings, parties, product launches, openings - the bottom line is, nearly everybody loves a good coffee and The Tube supplies some of the best coffee around. At a private event, The Tube is not limited to serving just coffee. With two large fridges, we can elegantly serve chilled Champagne, wines, oysters perhaps - anything you'd like your guests to enjoy. Get in touch if you're interested and I' be more than happy to talk about your needs (or just say hi). Organic Certification GB-ORG-04. Full and sweet with fruity length and cocoa aftertaste. Our organic espresso is a combination of our certified coffees from Limu (Ethiopia), Tunki (Peru) and Finca La Esperanza (Colombia). To complement the organic coffee The Tube also uses organic milk. Our environment is not an option, at least at this point. The Tube seeks to reduce it's resource impact on the world wherever it can. Compostable, sustainable source packaging is one thing, but also every year we plant trees in order to help offset any carbon created through the use of fossil fuels - not ideal but pro-active.